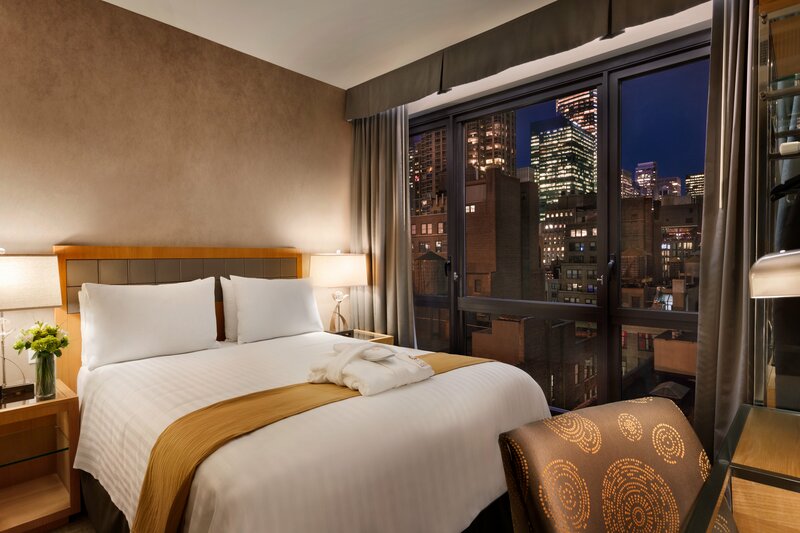 New York City, NY, February 12, 2018	(Newswire.com) - ​​​​The newly opened Executive Hotel le Soleil New York (http://www.lesoleilhotels.com/new-york/), a contemporary European-styled 161-room boutique hotel situated in the heart of Midtown Manhattan, has received the 2018 AAA Four Diamond Award, property officials announced today. Coveted throughout the hotel and hospitality industry, the AAA Four Diamond rating for lodging is awarded to less than four percent of luxury establishments in North America. The Executive Hotel le Soleil New York joins a select group of AAA Four Diamond Award winners. To be considered for AAA rating and approval, lodging establishments and restaurants must undergo a thorough inspection by one of AAA’s 65 full-time, highly trained professional evaluators. These evaluators assess the cleanliness, ambiance, amenities and service of over 60,000 hotels and restaurants throughout the United States, Canada, Mexico, and the Caribbean. Located in Midtown’s fashion district on West 36th St between the prestigious 5th Avenue shopping corridor and The Avenue of the Americas, the Executive Hotel Le Soleil offers a AAA-approved Four Diamond experience. Guest amenities include a 24-hour fitness center, special concierge services and exceptional in-room dining experiences along with many other features. The hotel is home to Trademark Taste and Grind, a restaurant and artisan coffee bar offering contemporary American cuisine paired with classic cocktails, making Trademark a very popular casual option for lunch, dinner and late-night dining. With 3,000 square feet of meeting space, the Executive Hotel Le Soleil also accommodates meetings and events, offering a sweeping high ceiling lobby with custom faux-painted walls and ceilings complimented by colorful art-inspired wall sconces. Playing into the Soleil “Sun” inspired theme is a stunning chandelier, making the hotel very ideal for wedding parties, group events and other glamorous social occasions. The hotel is conveniently located in walking distance to many of New York’s most well-known attractions including Times Square, Madison Square Gardens, Bryant Park, the Flatiron District, Rockefeller Center and Saks Fifth Avenue. 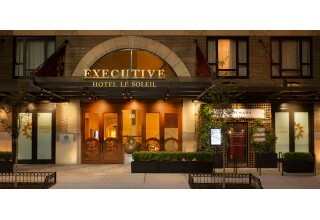 Learn more about the Executive Hotel Le Soleil New York at http://www.lesoleilhotels.com/new-york/. Additionally, discover the Le Soleil Collection as well in Vancouver, BC, at the original Executive Hotel Le Soleil Vancouver, which is also a recipient of the prestigious AAA Four Diamond rating. Learn more about this stunning hotel at http://www.hotellesoleil.com/vancouver/. Enjoy all of the Executive Hotels & Resorts locations including our two newest additions coming soon - The EXchange Hotel Vancouver (www.exhotelvancouver.com) and the Seaside Hotel, Spa and Provisions on the North Vancouver waterfront (http://seasidehotelvancouver.com/). All Executive Hotels can be viewed and booked at www.executivehotels.net.